Sorry about last week, everyone! Our servers had a major DDOS attack followed by a crashed A/C unit that took out the server my blog is on, and corrupted tons of my files. I barely made it back, but back I am! I didn’t end up visiting everyone from last week, and I’m so busy it will take me time to catch up. Sorry about that! Great haikus this week! I’m envious that you can write more than one per week! I think it’s pretty amazing that just one little whiff of something can transport us from where we are to where we have been quicker than any magic carpet! 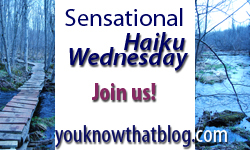 Been awhile…been missing haiku wednesday! too many men don’t smell like men any more . Comment showed up a-ok, so 3rd time must be the charm! I agree, “indecently delicious” … hmmmm! Nice to be back after nearly 4 months! You have some of my favorite scents in your lovely Haikus and it feels very refreshing. Ah … to write about a scent I love. Tomatoes have a very interesting scent, but alas, I cannot write about a scent that I love. I can no longer smell. Wish I could comment on your blog, Raven! Have you read my post about protecting yourself while enabling name/url on your blog? I can’t imagine losing my sense of smell – although I bet I’d lose weight rapidly given that food scents are usually better than the food itself! Will you ever get it back or is it gone for good?? Poor you!! I’ve had fun with this week’s prompt, but I’m already experiencing frustration over next week’s! First time here. I love haiku. Invite open to all haiku lovers also of course!